Candy Crush Saga not your ordinary match-three puzzle game. Cuteness doesn’t usually equate to a low level of difficulty. On the contrary, this game pushes you to your limits and before you know it, you’ll have a love-hate relationship after playing a few rounds. In the end you alone can decide which way you really feel about this deceitfully challenging puzzle game. Now, before you say these games are all alike, hear me out. In this one, the rules are a bit stiff. 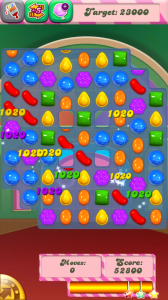 Of course you’ll need to match at least three candies of the same kind to clear them off the board, and special candies with special powers are formed when matching four or more candies in a certain way. 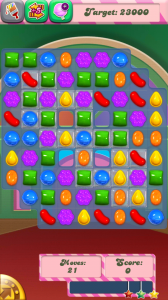 For instance, forming a T-shaped match creates one wrapped candy which can zap out all of one kind of candy on the board. 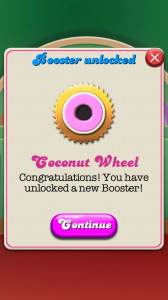 As you level up, certain boosters are unlocked. This doesn’t mean you can use the booster right away, though. 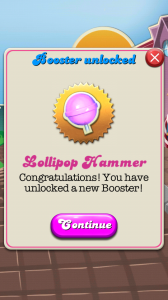 It just means that booster is unlocked for you to buy — with real money — from the Play Store. This is a bit misleading, and I was mildly disappointed and annoyed when I learned about this setup. If you let your kids play this game, be wary of any accidental purchases they might make along the way. 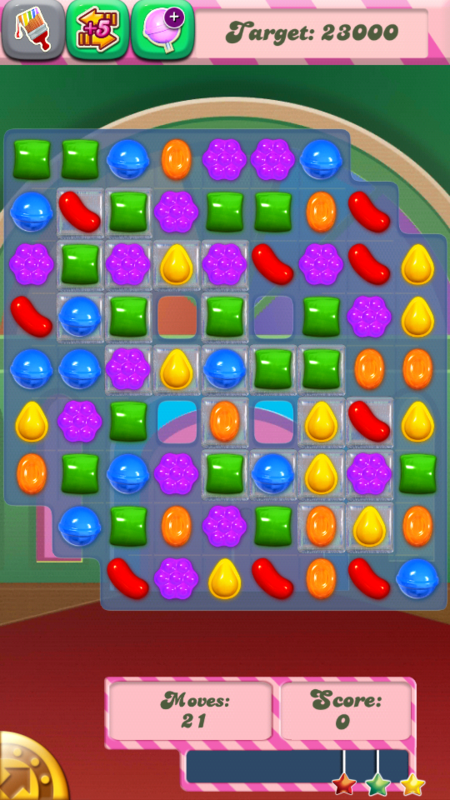 Here’s the catch: there is a goal for clearing the board. 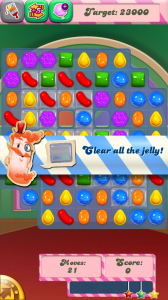 Unlike other games like Bejeweled, each round in this game has an objective. It’s usually something like “Clear all jelly” or “Bring down all fruit to the bottom”. In addition to having a directive, your moves are also limited. 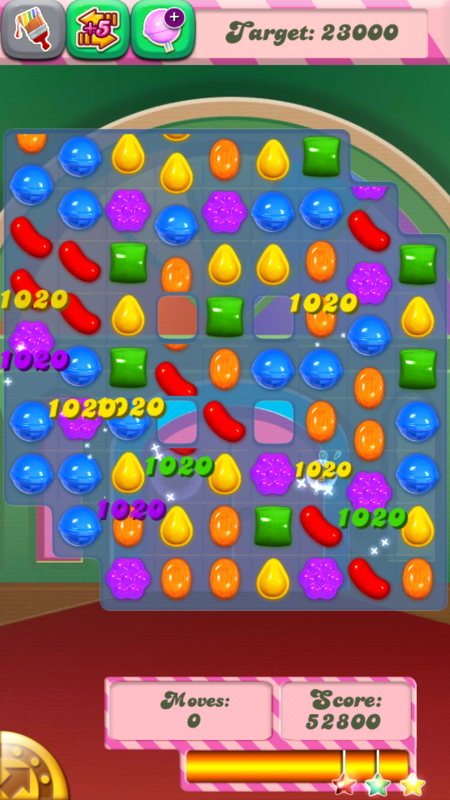 The number of moves left is indicated at the bottom left corner of the screen. The limit doesn’t depend on whether or not there are any moves left in the board — it’s actually determined by the rules of the game. So it doesn’t matter that you can still see a way to clear some lines of jelly, if the Moves counter says zero, you can’t do it. To add to the dilemma, the playing board’s structure changes with each round. You won’t ever see a board completely filled with candy — no, that would be too easy. 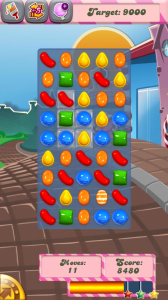 Instead, you get a variety of interesting candy placement that pits it against blocks, making it even hard to match candies together. 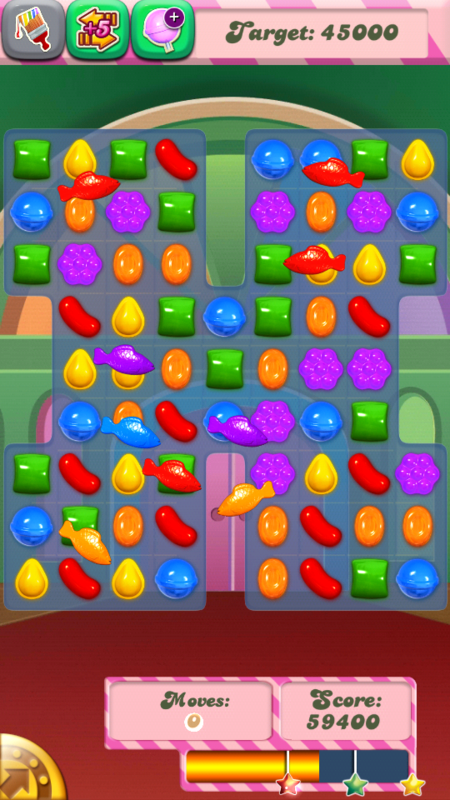 You’d have to be incredibly clever to maintain a winning streak with this game, as it gets harder from one level to the next. 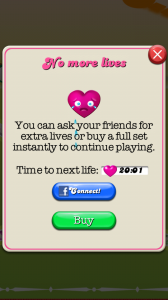 There’s also a limit as to how many times to can play the same level, after which you’ll need to wait for a specified number of minutes before you can play again. 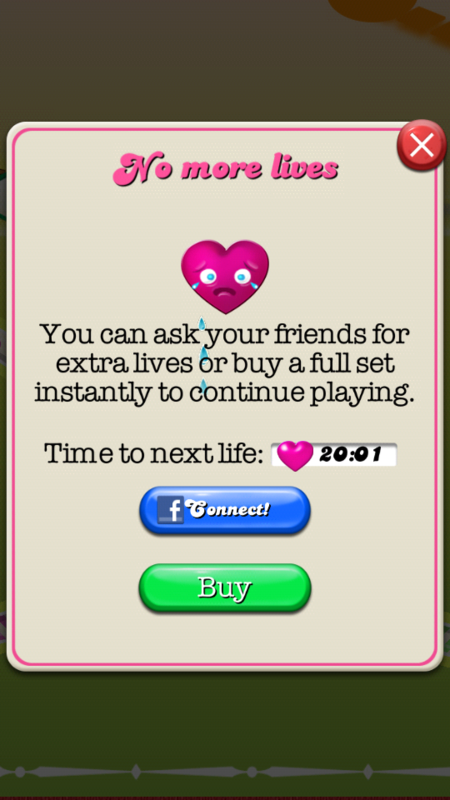 If you don’t want this annoyance, you can buy extra lives with real money from the Play Store. There are a lot of stuff that surprised me with this game, particularly how challenging the puzzles are. I’m also a bit put off by the number of features that you need to pay for such as extra lives, boosters and other things that are usually free in other games. 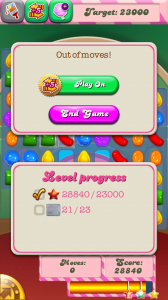 The good news is, it doesn’t look like you have to pay for anything to keep playing the game — it just might take you a year before you finally get through all the levels. Kidding aside, in-app purchases are perfectly fine for those who don’t mind spending to skip the waiting and advance much faster in the game. 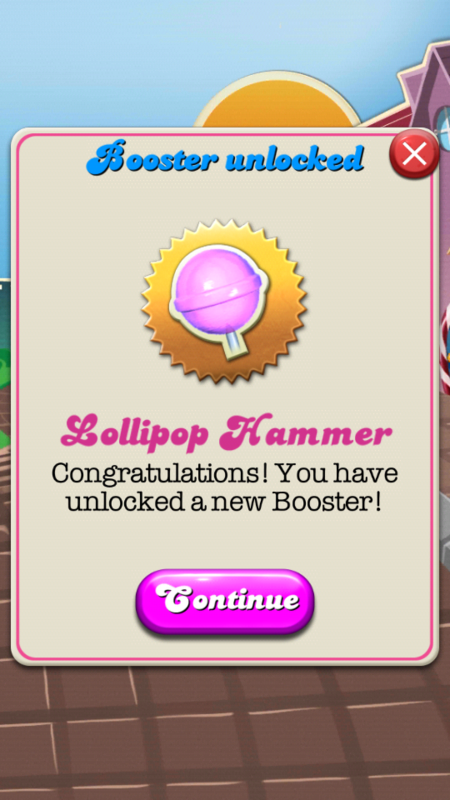 But if you’re lucky (or really, really good), you’ll get through levels without any boosters. Another fun aspect about this game is its ability to share your high scores in Facebook, and see how your friends are doing too. You can connect to Facebook within the app and view a leader board ranking you against your friends. Since this game is also about high scores, this is great if you’re the competitive type. 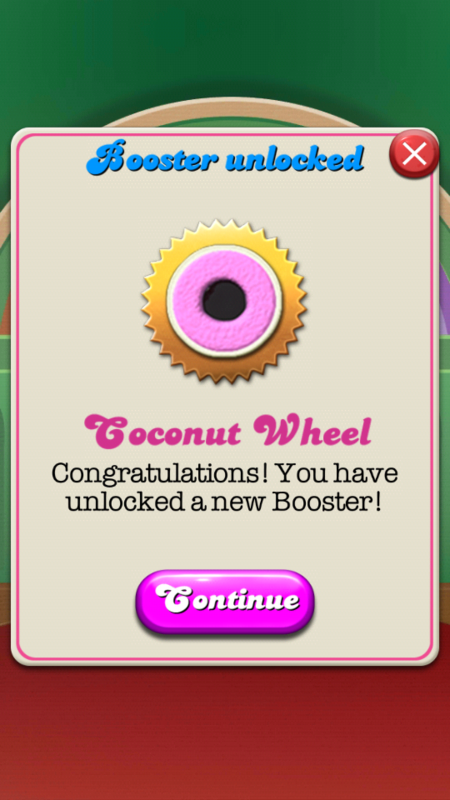 After all, if you’ve worked hard on completing a level, it’s only right that you’d want to show it off to your friends. Despite its caveats, I still think this game is one of the best puzzle games I’ve played in a long time. It’s well designed, the graphics are delicious, and most of all, it’s a puzzle that actually encourages you to stop swiping mindlessly and think. Candy Crush Saga is both a delight and a challenge. 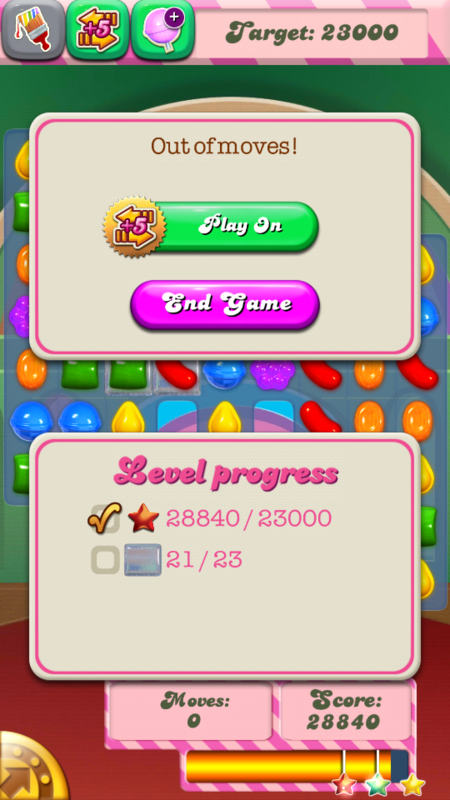 Part of its appeal is the tremendous amount of pride you get when completing any level. More than the high score, the level of difficulty puts a great value in moving up — something that’s often taken for granted in other games of its kind. Puzzles are meant to be challenging, and this game just took that to a whole new level.